Many years ago I came across this recipe on Wednesday Chef for Baked Eggs with Leeks in Cream and I’ve been making my own version ever since. One of the best reasons to make this dish is that it’s quick and easy, yet it looks and tastes like it took much longer. The perfect brunch to impress visitors. The beautiful thing about this dish is that it can be made with whatever you have in the kitchen or whatever happens to be in your harvest basket that morning. In mid summer tomatoes, peppers and basil would be heaven; in spring asparagus, leeks and cheese are perfect. The possibilities are truly endless. Assemble them the night before letting them rest on the counter overnight or if you’re squeamish about food being warm put them in the fridge overnight (they’ll cook much better if you warm them on the counter for an hour before baking). Preheat to 350 degrees with rack in center. Rub inside of ramekins or cocottes with bacon grease or butter, set aside. 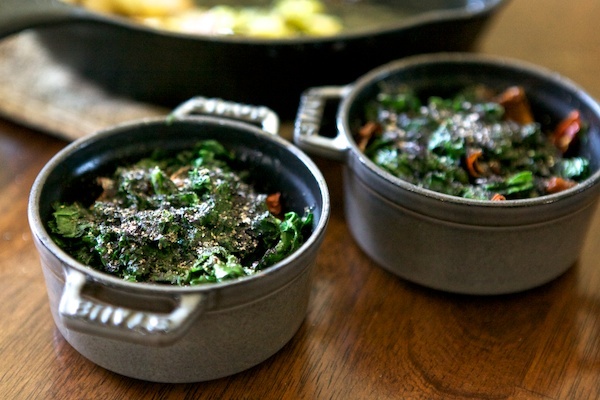 In a cast iron skillet, melt butter or bacon grease and cook vegetables until soft. 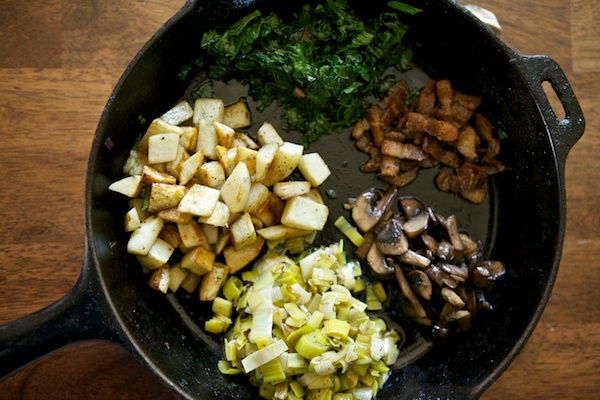 If you’re adding a variety of vegetables you can add each one to the pan in cooking length order (ie. potatoes first and leeks last), or you can cook them all separately so family members can assemble their own cocottes with whatever they like. Layer vegetables into bottoms of dishes, crack an egg on top of the vegetables into the middle of each dish (or two if you dishes are larger or you want a heartier meal). Add enough cream to just cover the egg white, usually 2-4 Tablespoons for each dish. Sprinkle with salt and freshly ground pepper. Place dishes on cookie sheet and into the oven for 15-25 minutes, until egg whites are cooked and yolks are still soft. If you don’t like runny yolks cook a little longer. Sprinkle with chives or chopped herbs after removing from the oven. Serve as is or with a piece of good crusty bread for dipping. The filling options are endless, these particular ones were made with: leeks, potatoes, sun dried tomatoes and sautéed kale. But you could easily add bacon, smoked salmon, sausage, herbs, spinach, cheese, onions, olives, peppers, tomatoes, zucchini…. I like egg yolks as runny as they can be with the whites just barely set. Mr Chiots isn’t quite into that as much so his stays in the oven a little longer. 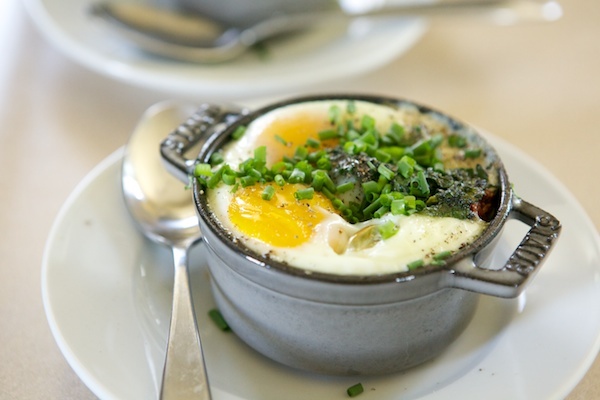 What about you – runny yolk or cooked through? Yes they are – they were a gift from Mr Chiots last year. 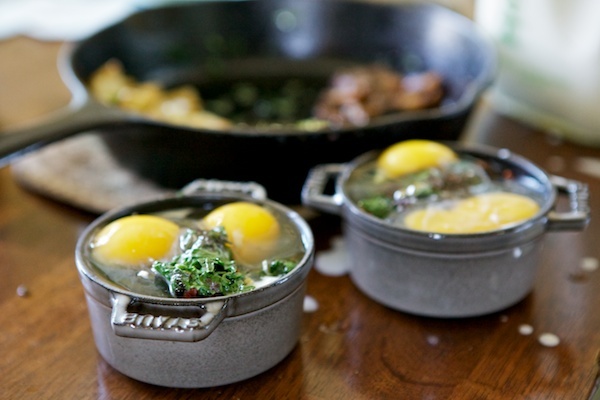 Enameled cast iron goodness from France. They’re fantastic for baking individual servings for anything from these savory egg breakfasts to berry cobbler! Done. All the way done. Even slightly soft yolks gross me out. Unfortunate, but there you are. This looks like the perfect late spring meal – when things in the garden are ramping up! Such easy meals I’m planning around this… mmm. I really need to get myself a proper ramekin. I am a runny yolk girl. When I do make fried eggs my hubbie’s egg has to go on first, and cook till stiff. I crack mine, let it get it’s shape, shut off the heat, and flip it – done. Brilliant! I’m making this tonight.